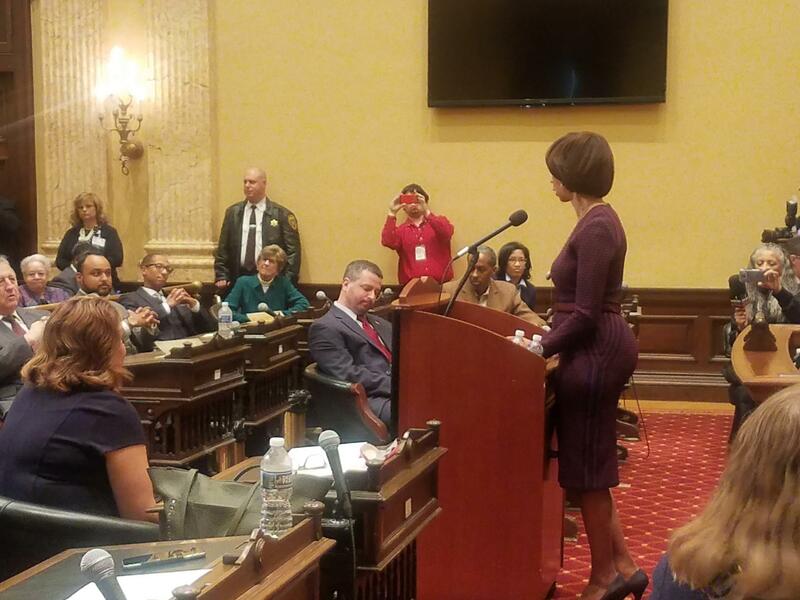 Baltimore Mayor Catherine Pugh delivers her state of the city address Monday to a gathering of city leaders in city council chambers. NATHAN: How did the mayor qualify “Baltimore: A city on the rise” in her speech? NATHAN: Pugh also called on the Fraternal Order of Police to take action, what would she like to see from them? DOMINIQUE: Pugh made a strong ask from the FOP to allow civilians to sit on Baltimore City Police officer disciplinary hearing boards. She has pushed this at the state level with no success, but asked the FOP last night to pass this policy without legislative action required. NATHAN: Can you explain that a little more? NATHAN: Pugh also talked a lot about creating jobs and her effort to increase the employment rate. How does she plan on creating more jobs? the majority of those unemployed are African American males. She said she created the Office of African American Male engagement to help with job searches and applications. In mid-April, through the support of an anonymous donor, Pugh said that the city will be opening a mobile jobs unit. She also talked about her youth works summer jobs program that has already had 16000 applicants. NATHAN: What sort of reaction did you get from city leaders? DOMINIQUE: City Council President Jack Young said that Pugh was talking about what she promised during her campaign and what she has already delivered on. DOMINIQUE: He is right the full speech went a little longer than an hour, but she did lay out what she promised to do and what she has already delivered on. You can also view this speech as her future motto for her 2020 run for reelection. That motto is “Moving Baltimore Forward”, and she said that at multiple times in various different ways throughout the speech. DOMINIQUE: Baltimore City State’s Attorney Marilyn Mosby, who is up for reelection this year, said that unlike the federal administration that is touting regression, we need to focus on local and state governance to progress forward. And she said that Baltimore could be a model for other cities in the US.